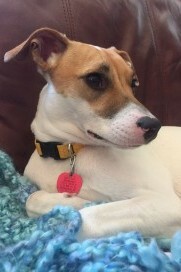 Wynnie was rescued from Elmbrook Humane Society at eight months old. She is a American Staffordshire Terrier/Rat Terrier/Treeing Walker Coonhound mix (according to her doggie DNA test). She was sent up from a shelter in Mississippi when a home could not be found for her. Dr Johnson chose Wynnie because of her cautious and gentle nature. She is extra cuddly and shy at first but quickly gets comfortable especially if everyone is sitting down and she can approach rather than be approached. She is a highly intelligent dog that learns quickly and enjoys running on Dr Johnson’s horse ranch. If you are allergic to dogs please make staff aware. If you would like Wynnie present in your session you may request her if she is available that day. Mostly, she sits next to people and loves to be pet while you have your session.